I’m pretty excited to share this cocktail with you because, well, it’s delicious and it’s pretty, but also because it’s one of those recipes that just came together perfectly just the way I imagined it! Last week, I attended an amazing cocktail party benefitting the Helen David Relief Fund for Bartenders Affected by Breast Cancer. The event featured 12 specialty cocktails prepared by some of Las Vegas’ most esteemed mixologists! I only made it through 5 cocktails that night (and that was an amazing feat all it’s own) but I left there with a fuzzy memory of a pretty, frothy cocktail garnished with a sprig of fresh lavender. And with that vague memory, came the inspiration for this cocktail. Now, if last week’s cocktail, the Martinez, could be considered a man’s drink, then this one is for the ladies! And by that I mean in a “strong enough for a man but made for by a woman” kind of way! 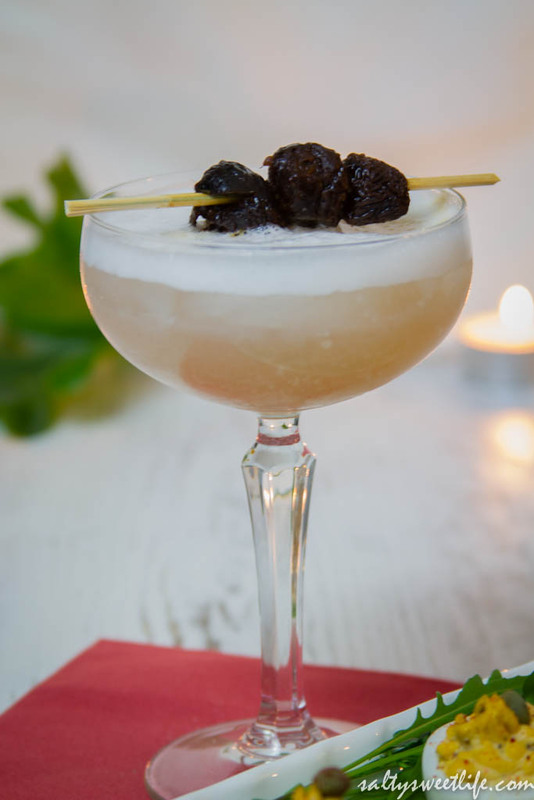 Like the Martinez, it’s a gin-based cocktail, but lightened up with an egg white froth, an herbes de Provence infused simple syrup, a splash of lavender bitters and garnished with Cognac-soaked cherries! What could be better? I found the original recipe for the Lusty Lady on the Scrappy’s Bitters website, but have changed it a little to enhance the herbal and floral notes of the lavender bitters. The bitters are a fairly essential part of this drink and if you don’t already have bitters in your home bar, Scrappy’s Bitters has a great selection. I found them locally at Total Wine and they actually had a bitters assortment that included orange, lavender, celery and aromatic bitters. 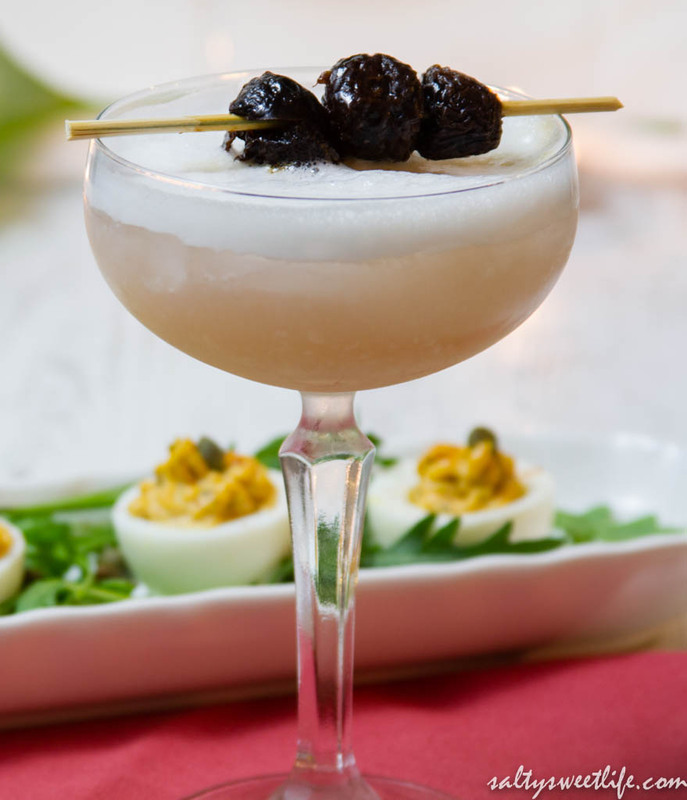 You may have noticed that there is an egg white in this drink–egg whites are used in quite a few classic cocktails and it adds a creamy, frothy cap, almost like a latte. Of course, use fresh eggs from a reputable source, but also know that the lime juice and the alcohol in the gin will neutralize the risk of pathogens. **Plain simple syrup can be used for this drink, but I wanted to highlight the floral notes of the lavender bitters with a simple syrup infused with herbs de Provence. Typically commercially produced herbes de Provence will include marjoram, savory, rosemary, thyme, lavender, basil and sage. You probably have some tucked in the back of your spice rack and it’s probably lonely, so go take it out and use it! You’ll want to first make sure that your spice blend does not include garlic, because that would not be tasty! Simply combine one cup of water and one cup of sugar and one tablespoon of the herbs de Provence in a small saucepan and heat until the sugar completely dissolves. Remove from the heat, cover the pan and steep for about 30 minutes. After the mixture has cooled, strain through a fine mesh sieve lined with a paper towel and store in a glass jar in the refrigerator. While your simple syrup is steeping, make the cherry garnish by placing dried cherries in a microwavable bowl with 1/4 cup of brandy or cognac. Place in the microwave for 30 seconds, and let the cherries soak until they become plump. Thread the cherries onto a skewer or drink pick and set aside. Place all the ingredients in a cocktail shaker and shake vigorously until frothy. Add a few ice cubes and shake a few seconds more to cool the drink. Strain into a frozen coupe or cocktail glass. Top with the boozy cherries! 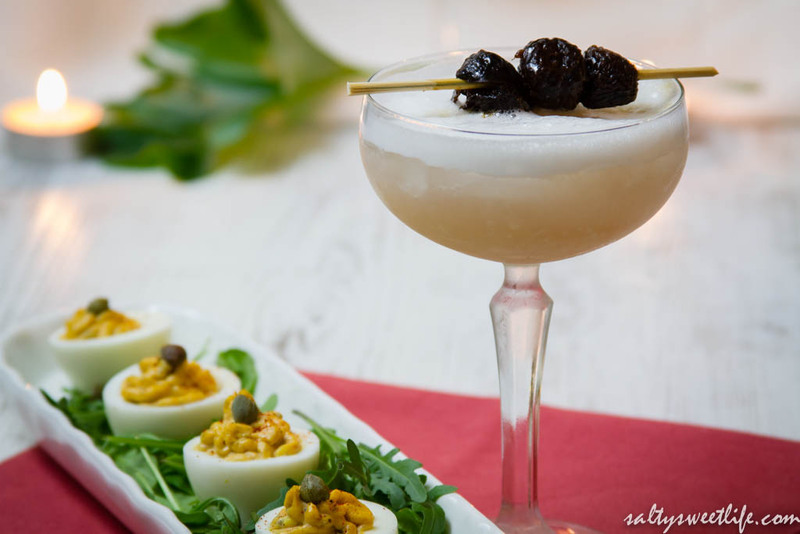 How about some smoky deviled eggs to go with that cocktail? Deviled eggs are on my list of foods that I can’t resist, like hot french fries, potato chips, and anything involving a cocktail wiener! I fully intended to bring a batch of these to work after I tested them, but I ate them all. Sorry guys! The smoked paprika and curry powder give these eggs a wonderful smoky flavor which is balanced by the subtle heat from the cayenne pepper. Briny capers step in for the sweet relish typically found in traditional devilled eggs. 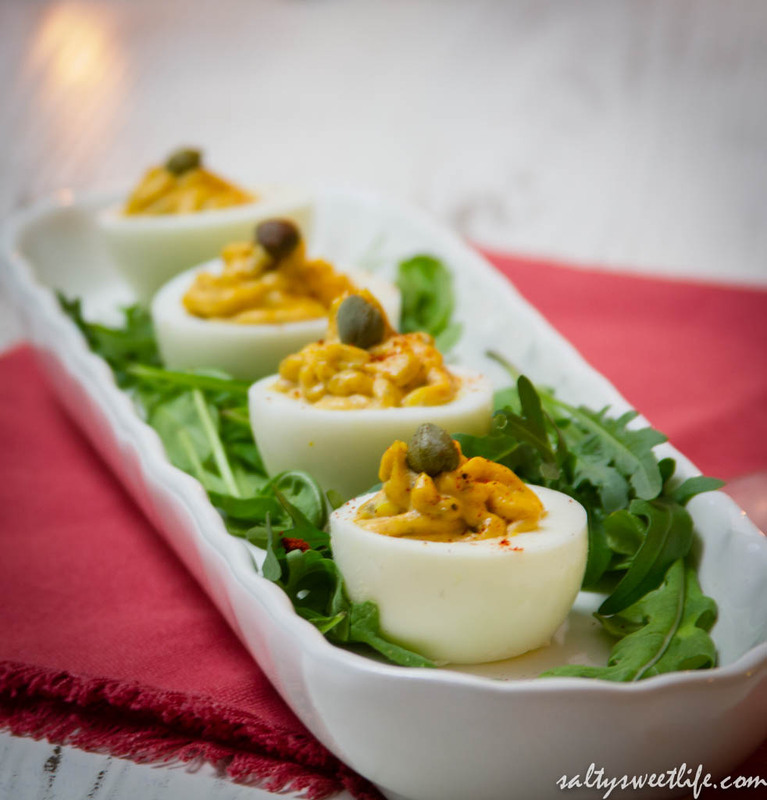 Adapted from the recipe for “Blue Smoke Deviled Eggs” from “Mix Shake Stir” by Danny Meyers. Peel and halve the hard boiled eggs. Scoop out the yolks and place them in the bowl of a food processor along with the remainder of the ingredients, except for the salt and pepper. Pulse a few times to combine, then process until the mixture is creamy. Taste the mixture and add a pinch of salt if needed, though you likely will not need any because of the saltiness of the capers. Add a few grinds of freshly ground black pepper and mix thoroughly. Put the mixture into a piping bag if you like feeling annoyed, and pipe the mixture into the egg whites. If you want to be less fussy, simply spoon a small amount of the yolk mixture into each egg half. Garnish with a sprinkle of paprika and a caper if desired. Try not to eat them all! (1) I want all of this! It looks beyond delicious! ; (2) I LOVE that you referenced a deodorant commercial tag line; and (3) thanks for the tip on the effect of lime juice and alcohol on egg pathogens. I’ve always been a little hesitant about cocktails with raw egg whites, but no more! Aw!Thank you! I’m showing my age a little bit with that commercial reference, don’t you think? 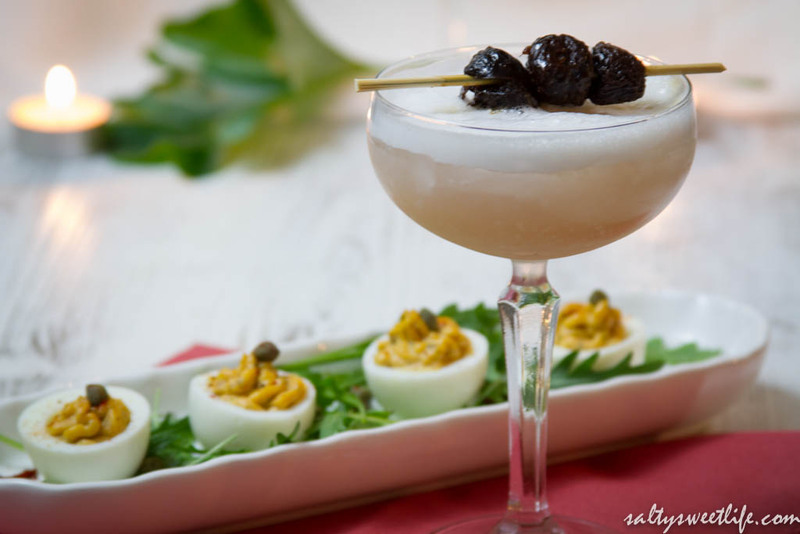 I really hope you will try a cocktail made with egg whites because they are awesome. I was daunted the first time I tried one, but I’m completely over it now! Hey, how was your work thing? Thank you for the mention! Great article!